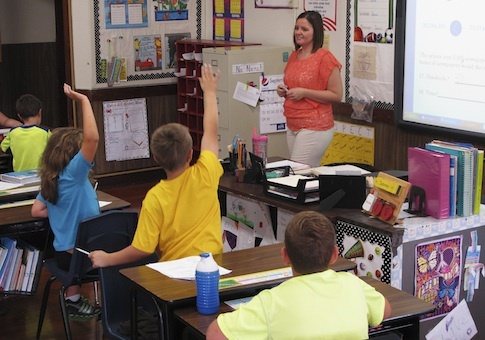 A survey conducted by Education Next finds that support for the Common Core Standards is declining, following a national uprising against the standards from opponents on both sides of the political aisle. Federal Race to the Top funding prompted 45 states to adopt the standards in 2011, but since then five states–all with conservative governors–have repealed or placed the standards under review. Virtually every aspect of the standards, from the federal government's role in promoting them to their educational merits, has come under fire. 53% of the general public supported the standards according to this year's poll, contrasted with 65% just one year ago. Opposition doubled from 13% to 26%, while 21% have not yet formed an opinion. Opposition has grown the most among Republicans–37% oppose and 43% support the standards, while only 16% opposed and 57% supported them in 2013. But even Democrats have seen growing opposition: 17% now oppose the standards, while only 10% opposed them in 2013. The drop in support among teachers is also noteworthy since teachers were found to more accurately perceive what the standards entail than the general public. Common Core supporters often argue that the public only opposes the standards because they misunderstand them. Teachers unions have also balked at the standards, with one National Education Association affiliate revoking their support for the standards in New York. This entry was posted in Issues and tagged Education. Bookmark the permalink.